Wh at if you took Jack Kirby, Still Alice, and Ordinary People and threw them into a blender? Donny Cates, Geoff Shaw, Jason Wordie, and John Hill provide a cogent response to this question in their comic book God Country. I picked up the last few issues of this book and fell in love with everything about it. The art was dynamic, the colors rich, and the story both quiet and madcap bonkers. I had to wait for the trade to come out to be able to read the story from beginning to end and it was well worth the wait. 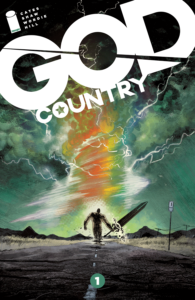 God country was to me a story about two families trying to hold themselves together in the face of great disasters. The Quinlan family lives in west Texas. Roy is trying to raise his family which consists of his wife and young daughter. He is also trying to take care of his father who is deep in the grips of Alzheimer’s. We meet the Quinlans as a storm approaches their home both literally and figuratively. Roy is called home by the sheriff as his father was found wandering out by the road. The sheriff wants Roy to come inside to discuss the issue when his father, Emmett comes out in full rage.Emmett does not remember his son, daughter-in-law, or granddaughter. He is screaming epithets at them to get them off his property. Everything comes together in these pages to show you the blind rage of a man lost in his own head, the fear of family members that do not know what he will do, and the sadness of a son trying to do his best for everyone involved. When the calm of the family storm subsides, the literal storm hits brings tornadoes that tear the house apart and pulling Emmett into its heart. From the chaos of the storm comes a true demon standing twenty feet tall. Roy, desperate to save what remains of his family, bravely steps between his daughter and the approaching demon. With thunderous fury, Emmett returns with a sword the likes seen in Final Fantasy 7 or Werewolf: The Apocalypse to destroy the demon. Thus is the second family drawn into the story. The sword, Valofax, is the god of Swords. They were created by God of Kings Attum who keeps the Kingdom of Always from slipping into oblivion through sheer will. Valofax left his previous wielder, Aristus, God of War to kill the demon that destroyed the Quinlan farm. The Kingdom of always is an empty place, populated now only by its King and his two sons. The other gods had been sacrificed by their king to retain old glories in the face of eventual oblivion. Aristus, much like Roy, strives to be his own person while serving the will of his father and sovereign. Valofax has no such compunction. The story trips off the charts into Kirby Crackle territory without ever losing the humanity at its heart. Valofax restores Emmett to his mind prior to the erosion of his memory due to Alzheimer. The story explores what it means to be given your personality back and what you would be willing to do to keep it. It also delves into what it means to be a soon and when the line has to be crossed to be your own person and let your father’s madness take them to where they are going and not let it destroy you. The creative team on this book have created something special. The story is both a quiet piece about families and an epic tale of hubris amongst the stars. Cates captures both of these ends of the spectrum and all points in between with his story. The humanity of the characters, even Valofax is never in question. Even though Valofax speaks in a stilted manner, their voice is clear in it’s motivations and emotions. It cares about things and understands the consequences of actions. Cates made me care about everyone involved, even Valofax. Shaw’s art is evocative. They capture the emotions that Cates story holds and stretch them across the page. The worn look of Emmet and the sharp edges of Valofax all capture the essence of Cates words and echo them from the page into your head. Combine this with the palette brought by Wordie and the visual imagery of God Country is just phenomenal. The pages both carry the heat of a west Texas evening and the cold of the depths of oblivion that the Kingdom of always teeters on. There are so many single pages scattered throughout this book that will just capture and keep you from moving on in the story while you appreciate the power of each one. I enjoyed God Country immensely and have read the trade several times. It would make and excellent addition to anyone’s library. Nice. That sounds intense. I’ll throw it into the long pile of to-do reading I’ve got.